LINEUP: Elliot Johnson, Reid Brignac and Sean Rodriguez will share middle infield duties. The biggest question now is determining who will play first base. Johnny Damon, Ben Zobrist and Dan Johnson could all see time there. And who gets the bulk of the time could be dependent on whether Joe Maddon prefers Matt Joyce or Dan Johnson in the lineup more often. BENCH: The final spot may come down to Sam Fuld and Justin Ruggiano both of whom are out of minor league options. With left-handed hitting outfielders Johnny Damon and Matt Joyce already on board, Ruggiano seems like the better fit, even if Fuld is the better talent. ROTATION: With Matt Garza gone, his spot will go to Jeremy Hellickson, but when? We still wouldn’t be surprised if Andy Sonnanstine is in the rotation the first couple of weeks. BULLPEN: Five spots appear to be spoken for. Adam Russell is out of minor league options, so he is in. Cesar Cabral has to be on the opening day roster as a Rule 5 pick. But if the Rays pick up another relief pitcher before the season, the Rays may be OK with sending Cabral back. Also, look for Cesar Ramos to keep JP Howell’s spot warm until he is back from the DL. I like Elliot Johnson, but I feel its nearly time for Sean Rod to be everyday starter at 2b. Wouldn't Joyce get to start in RF on most days? AT least against righties? but then what are you doing with Zorilla? didn't Friedman say Zobrist was no longer going to play second base? Do they not want Zobrist at 1b against RHP? Maybe they value Johnson's power? It will be quite a balancing act for Joe this year. I would much rather see Damon at 1B, BenZo at COF with Joyce. BenZo's speed, range, and arm are mitigated at 1B and his bat doesn't play well there. Dan Johnson should get useful ABs spelling our older guys at 1B and DH and even the odd game or 2 at 3B. And he makes for a pretty fair pinch hitting option v. RHP, at least according to Papelbon. Damon's bat plays well at first base? I totally agree Ben's defense is wasted at 1st and I have no idea who is the better first baseman (though I would guess zobrist), but the bat argument goes out the window when talking about putting Damon there. I'm still thinking we have a deal left for us out there... too many MLB ready guys that have to be on the roster (i.e. no more options, paying them too much, etc.). I would also love to see us get something back for Shoppach. I just don't see Damon playing 1B at all against lefties. I'm thinking Ruggiano in RF, Damon in LF, and Zobrist at 1B make a lot more sense. What is Ruggiano's arm like? Does anybody know if it is better than Zobrist's? Without being scientific and just judging him the old fashion way I would say similar arm strength but Zobrist has an advantage with accuracy. Range I would give a slight edge to Zobrist as well but Ruggiano did make a game saving catch in Sept 2008 which immediately makes him a gold glover to some. Damon does very well v. LHP. What has happened with Desomnd Jennings that nobody is thinking he will start in left? He's not ready. He'll start off in AAA and will be the first OF called up if needed. So Ruggiano shows to be more ready than Jennings? That baffles me because DJ was called up last year. Was Ruge hurt? Sure going to miss the speed out there! It's more a combination of Riggiano being out of options and Jennings needing more time. There's also Fuld who is out of options combined with another 6 guys, 7 if you count Manny, that can play the OF. To this point, I would think he at least has a shot in spring training, but it does sound like Andy wants him in AAA a little longer. but he better hurry, Jennings is not that young any longer. a .190/.292/.333 in 17 games happened. I think it's odd that Jennings is still considered such a top prospect after a so-so year at Durham and a very quiet major league debut. Without going to in-depth, I will try to explain. First of all, Jennings played in 17 gmaes in the majors. That is a really small sample size. Jennings did have a so-so year in AAA this past year, although it was due to injuries. The shoulrder and wrist injuries sapped his power and bat speed. That is why you still see the patience, but less average and power. Jennings is more of a .300/.400/.450 player than what he did last year. Even with the average year last year, Jennings has great speed on the bases and plays a good defensive CF. The bat is an extra. If Jennings were to start the year with the Rays in 2011, I woud expect him to play better than Damon. Damon may hit a little better, but Jennings is much better on the bases and on defense. Why did they bother getting Damon then? It was a business move to get people into the team. Damon is a pretty consistent player, and if you check out the comments of fans, most people seem to like him. People are skeptical of Manny however, so it was important for the Rays to get both. So the Rays pretty much took a 4.6 million dollar check out of their pocket to pay for someone the team did not need but who could garner fan support. I could win a contest and get 5 ABs for the Rays this year and the sample size wouldn't matter. Anybody who actually watched me flail around would know I didn't belong there. 17 games or not, I watched Jennings with my own two eyes and saw enough that if he doesn't improve he doesn't belong in the bigs. He --looked-- terrible. It was like watching Fernando Perez bat left handed. He was just overmatched. So unless Jennings shows something in ST I would say he has no business playing for the Rays yet. Agree w/ David. Whatever the reason (injuries, etc), Jennings did not look ready by any stretch. The fact that you think he would play better than Damon as of today is a little puzzling. You must not put any weight on veteran MLB experience, or career batting numbers, or a ridiculous streak of playing at least 150 games. Maybe Jennings has better tools as of now, but I don't see how you can say w/ confidence he would "play better". You have to get on base to utilize base path speed. Even if his OF defense is worse, Damon can still play 1b or DH. I don't think they got Damon just so we would like Manny. The guy is still an avg to above avg hitter who gets on base and doesn't get injured (in addition to being fan fav, clubhouse guy, and manny nanny). The Rays wouldn't give 5 mil to someone just to appease the fans imo. I would also agree with David and MJ, and should have noted that on my earlier comment -- it's not so much that Jennings didn't blow us away in 17 games, it's that he didn't look comfortable hitting major league pitching. But heck, we want and need him to be good, so let's hope Michael's assessment of his upside is right. It was 17 Games but only 24 At Bats which included a Double/Triple 2 walks and 4 strikeouts. I think every player goes through a 4-21 stretch at some point during the season. Also, Jennings is right-handed so I do not think calling him a left handed Perez is accurate. I think as he gets more time in the Majors he will look more comfortable. yes very small sample size for sure. I dont watch durham games, so all i saw was someone who looked uncomfortable in nearly all MLB at bats. Not saying he won't be a future all-star, but not sure i'd rather have him than Damon from day 1. I agree he is probably not better than Damon at least not at this point and like Beth, I am surprised he rates as highly as he does on prospect lists, I am just saying I would not put too much stock in 24 AB's. Guy has been a top 10 prospect for 2 straight years and the collective wisdom here is that he can't play after a bunch of pinch hitting appearances and spot play? Good thing Willie Mays didn't go 0 for his first 24 in the Rays system, as he'd be deemed a for sure failure. The Rays are simply holding down Jennings' service time, and bad mouthing him this off season to justify it to the fans who should be demanding his arrival (but someone have bought the company line). I believe in competition and meritocracy, not managing a speed guy's service time so much he'll be slowing down by the time he's gotten established in the majors. Jennings should have a chance to play in 2011 if he shows he can do it in spring training and can continue it through the season. All this other chatter makes no sense. I was of the view that Jennings should have been given a shot to fill Burrell's RH spot in the line up when he was waived last year. Instead, they gave Kapler and Baldelli a bunch of pointless at bats. i don't know if I like Joyce sitting on the bench. I feel like he's our best right fielder. So, the vs RHP lineup would have Benny boo at 2B and joyce in right. I also think Joyce will sneak into the vs LHP moving Benny boo to left. Just don't see Ruggiano sticking... In fact we are all of a sudden overwhelmed with outfielders, do we attempt to move any before opening day? I agree. He is our best RF. He kills righties and should get some time against righties. I think against lefties you are more likely to see Zobrist at 1B, Damon in LF and Joyce in RF. I don't want to live in a world where Ruggiano starts ahead of Joyce. Also, Elliot Johnson has shown nothing to make me think he is anywhere near the level of Rodriguez and Brignac, so I don't see how he fits into that rotation very often. Zobrist may be in that mix depending on how things shake out. At least we have a ton of flexibility if/when some of these guys get off to bad starts and Maddon needs to mix it up. Hey, Cork: how about a preseason contest on number of batting lineups Maddon uses this year. You pick the prize. Jaso will platoon and so will Rodriguez probably, although, I think they don't need to be. A little outside the box since he is actually getting paid and the Rays are in love with him but Zobrist, knowing every position well, switch hitting and random power, would that not be an awesome guy to bring in late into games? Just consider an actual everyday lineup for once. Biggest issue is well Zobrist but also 9-1-2 sets up 3 lefties in a row, however with a bench of Zobrist, Shoppach, E.Johnson and Fuld, we have both guys who can get the big hit and 3 of the 4 can come in and play great defense. 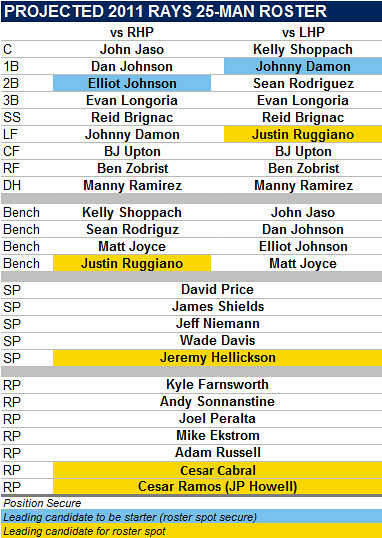 Elliot Johnson is nice off the bench, he should not be taking at bats away from Rodriguez and that will be the dumbest move ever if Ruggiano/Fuld takes Joyce's spot. Can't leave zobrist out of the lineup. Sure it would be easy to make a lineup if you negated him, but that doesn't make sense. Someone suffers and i don't think its Zobi-won. Fuld will likely be there instead of Ruggs. Zobrist will play mostly 2nd and Right(vs Lefties), and some 1st. I think Sean gets another look at short during Spring Training, which could put him in a similar multi-faceted Zobrist type role. My guess has Zobrist, Sean, and Elliot moving all over with Zobrist and Sean getting the vast majority of starts. Sean can spell BJ, play 2nd and possibly play short too. Oh yeah, that bullpen looks pretty weak. Toronto, Boston, and NY have solid ones(on paper); Rays pen = not solid(on paper). I can't think of any trades now that since the Texas/Toronto deal, but I am not a crafty GM. Rays need at least one legit back end bullpen arm besides Jake. If they can get one more legit arm, then it is on. Guys settle down. Most of the games Jennings played in he came in for one ab late in the game. That's not exactly the ideal way to break in. So if he looked over matched you can attribute it to that. He looked fine once he started to get comfortable, but simply put we don't need him right now. He can get consistent ab's in Durham until he shows he can stay healthy and we need him. I stand by my statements that Elliot Johnson and Ruggiano will not be on the team the whole year let alone starting on any consistent basis. Both will be Sunday only players and DFA at some point without worry. Ruggiano is a 4A player and Elliot Johnson did little in the minors until last year. If they succeed great. I surely hope they do, but they won't. They'll both hit sub .200 and look awful. Then most of us will question why they even made the team in the first place. And call the Rays cheap/stupid etc... because they made the team. The problem with Joyce is that he can't hit lefties. Hopefully Maddon gives him ab's this spring against him otherwise he'll just continue being a righty only platoon guy. 2 hits and 13 strikeouts in 25 ab's against lefties isn't encouraging. I think Jaso will get a lot of starts against lefties because once again Fat Kelly will hit .190. I see Jaso getting 100~110 starts. Hell they may even cut Shoppach if he's as bad as he was last year, but that depends on how the other catchers look. *We'll keep Cabral if the Sox don't want him back. A 5.81 era in single A isn't exactly encouraging news either. He's got good stuff but his stats were awful last year in single a.
I woudl be stunned to see Cabral win the 25th spot. Matt Bush has a better chance. Not something you should be posting on a blog; things like that should stay in the family. Your not doing him or your wife any favors. While I was excited to see both Jennings and Hellickson compete for ROTY, sending him back to AAA is the right move. He needs at least a good month or 2 back in the minors and the age thing is important. Crawford left before his 30th birthday, Upton will be what 28? when he leaves. The list goes on and includes Hellickson but oh well, Jennings wont be a FA right when his prime years are starting. He should be 30 or 31 when he is a free agent and if he has played well enough for a long term deal well, it was fun and some team will not get many good years out of him. Guys like Jaso and Joyce are good examples, they wont be up for free agency until they are 32 or 33, not that it would shock me if we lock one or both of them up. Oppening Day "lineup" as projected by Joe Maddon...."Who knows?" "Let me drink a bottle of wine and ride my bike around town....I'll get a few ideas....you won't believe"
Can you get a DUI for riding a bike drunk?? I just wish there was a way to issue FUI's--Filling out a lineup card While Intoxicated.